after making so many cakes, I hav to say that I am not tempted to each much cake. Except this one... 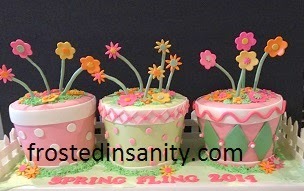 The green potted cake in the middle is an almond cake with raspberry filling and coconut frosting. MMMMMMM.... Had a tough time convincing myself to stay out of it!